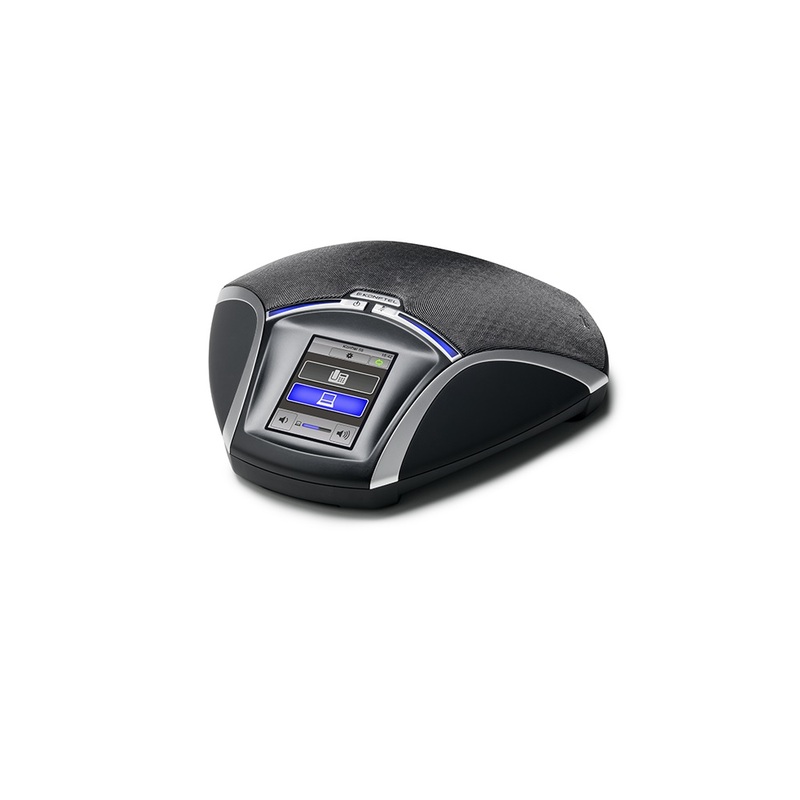 Konftel 55 | Avcomm Solutions, Inc.
• The Konftel 55 is an easy-to-use, compact conference unit with impressive, crystal-clear sound thanks to the patented audio technology OmniSound® HD. The Konftel 55 has been specially designed to be the hub of your communications and connects computers, mobile phones/tablets and desktop phones. 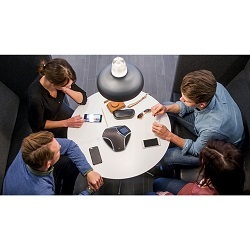 Whatever the communication tools, your meetings will be conducted with superior sound quality. Moreover, VoIP calls can be bridged with calls via a desktop or mobile phone. • Combine and switch connections easily on the LCD color screen's smart user interface that only displays the current connections. Make a call and the meeting is under way! The Konftel 55 lets you record calls or dictations and you can move the memory card (not included) to your computer to save or share the audio files. • The Konftel 55 is highly portable and looks just as good on the desktop and in the home office as in the conference room. • The latest software for the Konftel 55/55W supports the features of Microsoft® Lync®. There is enhanced support for answering / ending calls - call information is displayed, presence, redial, keypad, secrecy and voicemail. The Konftel 55 comes with a 6-meter electrical cable, AC adapter, battery, USB cable and a Quick Reference Guide. Item no. : 910101071. Menus/display: Danish, English, Finnish, French, Dutch, Italian, Japanese, Chinese, Korean, Norwegian, Polish, Portuguese, Spanish, Swedish, Turkish, German, Russian. Quick Guide: Danish, English, Finnish, French, Dutch, Italian, Norwegian, Polish, Portuguese, Spanish, Swedish, Turkish, German, Russian. OmniSound® HD. Microphone: Omnidirectional, 360˚. Coverage range: up to 3 m > 6 people. Frequency range: 100–24000 Hz. Volume: 90 dB SPL 0.5 m.
USB: USB 2.0 Mini B, connects to computer. Mobile phone: Optional cable is required. Deskphone: For connection to an IP or TDM desk phone using a Konftel Desk phone adapter, accessorie. Headset output: 3.5 mm phone plug (TRS/TRRS). AC Adapter: 100–240 V AC/12 V DC, included. USB powered: via included USB cable with inserted battery. 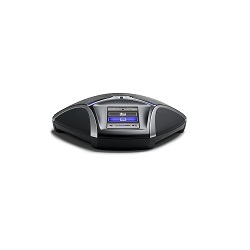 Battery: Rechargeable battery up to 9 h talk time, included. Support recording on SD & SDHC (≤ 32 GB) memory card. Konftel upgrade utility (for Microsoft Windows) upgrades software via the USB connection. It is also possible to upgrade via an SD card. Size: Width 222 mm, depth 206 mm, height 68 mm. Weight: 640 g. Colour: Liquorice black and silver. Display screen: Colour LCD, 240x320 pixels. Buttons: Touchscreen plus on/off and microphone/speaker switch-off. Temperature: 5° – 40°C. Relative humidity: 20% – 80% condensation free.